International yoga day commonly referred to yoga day is observed annually on 21st June since its inception. 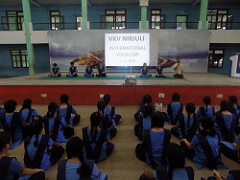 Today, our school Vivekananda Kendra Vidyalaya, Nirjuli too observed the yoga day with a series of programs. A total number of 824 people participated in the ceremonious program which included the staff members and the students. The program began with a formal welcome address by the Principal of the school with a vivid description of importance of the day, followed by a power point presentation by Smt. Rashmi.P with the following as its important highlights. To discover the sense of Oneness with yourself, the world and the nature. Union of Individual with Society, Nature… is Yoga. Practice of Yama and Niyama is essential in the Yoga way of life. Followed by the PPT was a practice of yoga demonstrations, conducted by Sri. AlokeshBoro in which the students participated enthusiastically and concluded with pranayama and meditation by all, feeling the oneness among everyone and everything.